1. What is the distance from the hotel to the airport? The distance is about 40 minutes in taxi. 1.1 How much does it cost to take a taxi from the airport to the hotel? It costs around $250.00 MXN. The taxi is the only way to go to the hotel zone and is very safe. 2. The hotel has its own parking lot? Yes, we have a parking lot located two blocks away from the hotel and, for added comfort, we also have valet parking. 3. What does the room include? Our rooms are equipped with one double and one single bed, complimentary amenities (shampoo, soaps, bottles of water, etc. ), hair dryer, Wi-Fi throughout the hotel, plasma TV with cable system, air conditioning, room service, etc. 4. Where is the hotel located? We feature an excellent location in downtown Tuxtla Gutierrez, only two blocks away from the Marimba Park where you can enjoy the traditional music of the state as well as eat in one of the many coffee shops around. At a short distance (seven blocks) is the San Marcos Cathedral with a spectacular light show; also at a short distance is the city square. 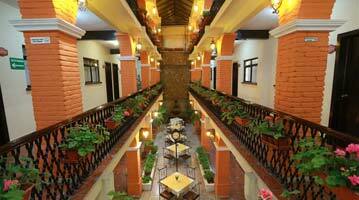 The Hotel del Carmen location will allow you to enjoy the stores in the surroundings of downtown Tuxtla. 5. Is breakfast included in your rate? Yes. It all depends on the package you book. Make sure to book the rate with breakfast included. 6. How can I make a reservation? 7. How can I guarantee or pay my reservation? 8. What does the breakfast include? Our breakfasts include juice, coffee and a menu with options to choose: eggs cooked any style, “molletes” or chilaquiles. You choose the menu! 9. Does the hotel have tours? Of course! We have tours with daily departures. Once you arrive at the hotel, you can book directly there. 10. When can I make the Check In? The Check In is at 13:00 hrs. 11. What can I do if I need to leave after 13:00 hrs? We can storage your luggage in our office and you can come and pick it up at any time you need without any extra charge. 12. What is the weather like in Tuxtla? The annual average temperature is 77.72 ºF (25.4 C). The warm season begins in mid-February and ends in September. The hottest time of the year is from April to the second week of May, where the temperature reaches the 104 ºF (40C). The cool season lasts from the second week of November to mid-February. The coldest time of the year is on December, when the temperature drops to 62.6 ºF (°C). Rainfall depends on the municipal areas and has an annual average of 900 mm. the normal rainy season is in May.